ThunderGod Zine: Blind Guardian libera vídeo ao vivo de "Prophecies"
Blind Guardian libera vídeo ao vivo de "Prophecies"
O Blind Guardian lançará o álbum "Live Beyond The Spheres" no próximo dia 07 de julho via Nuclear Blast Recs. O disco, que sairá em formato triplo, foi registrado durante a turnê europeia de 2015. 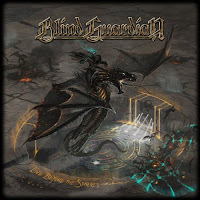 CD1: "The Ninth Wave", "Banish From Sanctuary", "Nightfall", "Prophecies", "Tanelorn", "The Last Candle" e "And Then There Was Silence". CD2: "The Lord Of The Rings", "Fly", "Bright Eyes", "Lost In The Twilight Hall", "Imaginations From The Other Side", "Into The Storm", "Twilight Of The Gods", "A Past And Future Secret" e "And The Story Ends". CD3: "Sacred Worlds", "The Bard's Song (In The Forest)", "Valhalla", "Wheel Of Time", "Majesty" e "Mirror Mirror".